Last year my family traveled from three different continents to meet up at a beautiful Caribbean beach on Mexico’s Yucatan Peninsula. 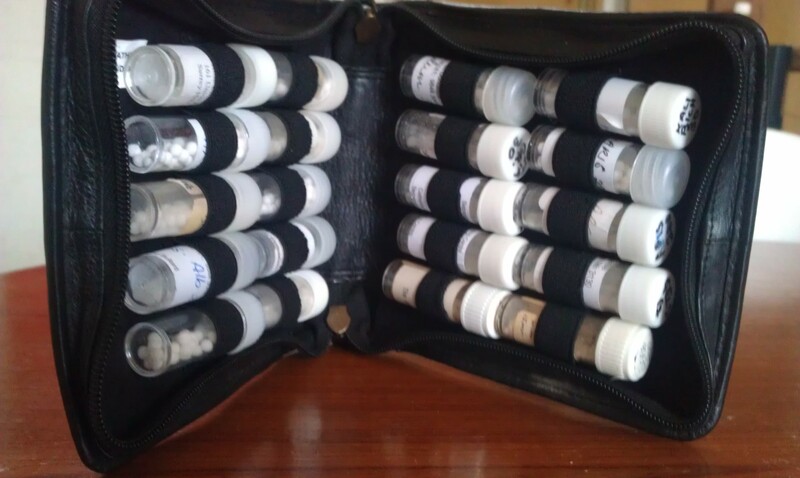 As always I took a kit of 25 Homeopathic remedies with me. The Homeopathic kit has traveled with me wherever I travel for over twenty years and has been invaluable for all sorts of acute illnesses and first-aid situations many times. Initially my kit included remedies for small children’s problems but as the boys grew the remedies changed a little to suit their changing activites and destinations. Remedies for teething relief eventually gave way to ‘hangover rescues’ and as we ventured overseas we added remedies for “Bali-belly” and jetlag. A ‘home’ Homeopathy kit containing twenty different remedies suitable for acute illness and first aid situations. Of course some remedies remained, the same remedy served for the effects of falling of a bicycle with training wheels as did for falling from a small Asian motorcycle. And some were always there because they were such fundamental stalwarts. Arnica is one that I would be lost without, in fact I can’t imagine raising a family of four boys without this gem in the medicine chest! Being a practitioner I have access to a broader range of Homeopathic remedies than are found in most kits, and I have the knowledge of a wider range of applications, so that I am able to tailor the selection of the Homeopathic medicines more closely to our specific need. But nonetheless I still often manage to find myself without the necessary remedy for the problem we face. When one son had his drink spiked in Asia I knew which remedy he needed to counteract the nasty effects of the drug, but not having it with me had to make do with another that while it did help ‘bring him down’ was not ideal. However, back to Mexico, as I said there are some remedies I never leave home without. We arrived in Mexico in the late summer and it was hot! Seriously hot, especially after coming out of the tail of the Melbourne winter. 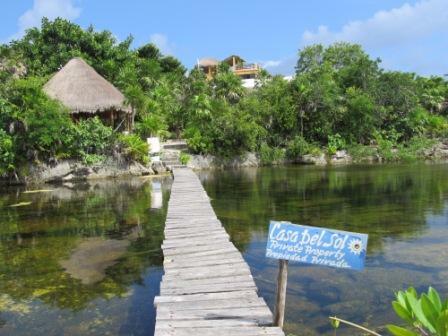 The villa we were staying at had a pool, sun lounges under the cabana and backed onto an amazing fish-filled lagoon. So the family was quick to soak up the long-missed sun and it only took one day before one of the boys came to me seriously sunburned. There are a number of Homeopathic remedies that are useful for burns, but there is one I always carry as it dissipates sunburn with amazing speed. But for hot, sunny Mexico I had forgotten to pack it. Luckily being Mexico the garden was full of succulents and a quick walk around the garden revealed our second treatment choice, a clump of Aloe Vera plants. My son broke a leaf applied the gel to his burnt skin with good healing results. 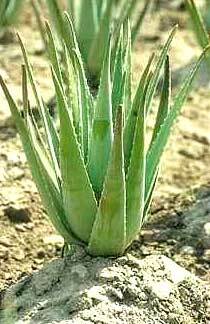 Most people know one of the characteristics of Aloe Vera is it’s ability to soothe the skin. But it is not only an excellent anti-inflammatory, it also actually heals any tissues it touches. It is great for skin problems such as acne, dandruff, eczema, dermatitis or psoriasis. (Although I prefer to treat psoriasis with a deeper-acting treatment like homeopathy) On the skin it will also help heal infections, although you must not apply it to any deep vertical wounds (such as those from surgery). And of course it soothes and starts the healing process for sunburn, cooking and ironing burns or insect bites. Many people drink Aloe juice regularly for its laxative qualities, as a general health tonic for the Gastrointestinal system, or to help build up the immune system. However, do not use Aloe if you are pregnant or breastfeeding, have a kidney disorder, IBD or intestinal obstruction, or for young children. Also, Aloe can cause irritation on the skin in some people with a specific sensitivity to the plant, although it is uncommon. AN ALOE IS AN ALOE, RIGHT? WRONG! There are over 240 varieties of Aloe and there are also a number of plants that look very like Aloe but don’t have the same healing properties. The one you need is Aloe barbadensis and the clue to identifying Aloe is in the way the leaves sit. In a true Aloe plant they all come up from the base in a circular pattern, like in the picture below. If there are leaves pointing in only a couple of directions it is not an Aloe. The edges of the leaf have short little barbs a bit like a cactus, although it is actually a member of the lily family and not a cactus. The fleshy leaves can vary in colour and even be spotted but they will always grow in this shape. There are lots of Aloe varieties but Aloe barbadensis is the one you want to use. The useful part of the plant is the gooey gel in the centre of the leaf. The outer part of the leaf contains constituents that can be problematic and you want to avoid. The outer part also has a bitter taste whereas the gel does not so if the juice or powder tastes bitter it is a clue that the product is not good quality as it has some of the outer leaf mixed in with the gel. The other problem that can be a problem with commercial products is that the gel oxidizes when it is exposed to the air for more than about four hours. This is like the apple going brown after it is cut. Some manufacturers buy Aloe gel and stockpile it for long periods during which time it deteriorates. Rather than wondering whether the bought product is truly good or poor quality it makes sense to formulate your own ‘Aloe’ products from your own plant. You can apply the gel directly to your skin, as my son did, to relieve inflammation, whenever there is a breakout, or as a regular beauty treatment. It is also useful for dry skin. You can also use it to de-frizz your hair before you blow-dry it, as it is the main ingredient of most defrizzers on the market. It is easy to apply because of its consistency. You can substitute Aloe for your shaving cream, it gives a great close shave and, being anti-inflammatory and with a high water content stops the need for moisturizers afterwards. In fact it sorts out razor burn beautifully – use it after you shower and again before bed. 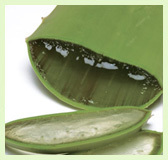 Aloe vera is high in a range of nutrients that will be absorbed into your skin. It contains all eighteen amino acids, including the eight essential ones, twenty minerals, the standouts being calcium, zinc, selenium and magnesium and twelve vitamins, including Vitamins A, C and E which benefit the skin because they have antioxidant activity that neutralizes free radicals. Aloes are very easy to grow in a pot on a sunny windowsill. They like hot, dry weather and are fine inside. They need almost no care and the danger is that they will die from over-watering rather than neglect. They are fine outside but you will need to bring them in during a cold snap especially if there is frost. Once your plant is established you can easily grow more by planting a ‘pup’ from the parent plant into some Cacti potting mix. Keeping a pot of Aloe vera is the best way to have a ready supply of fresh gel on hand. Cut one of the bigger leaves off the plant with a knife close to the base. Put the leaf onto a plate and leave it for about 20 minutes to allow the yellow sap to flow out. Then wash the leaf under running water. A Cucumber and Aloe mask is great after being out in the sun. It is also excellent for acne, or any stressed and inflamed skin. Peel and deseed ½ a cucumber and then process it to a smooth paste with about 2 tablespoons of Aloe vera gel. Spread over your face (and neck), relax for 20 minutes and then wash off gently. Alternatively, if you are pressed for time you can simply rub the inside of the leaf directly on your skin. It is safe to use on your face, although better to avoid the eye area. It will help heal outbreaks as well as tightening and toning the skin. You do not need to cleanse afterwards as Aloe is cleansing, and you can simply apply a moisturizer or face oil if you wish. This advice is not intended to replace the advice of your Health Care Practitioner. Please seek professional advice for serious medical problems.